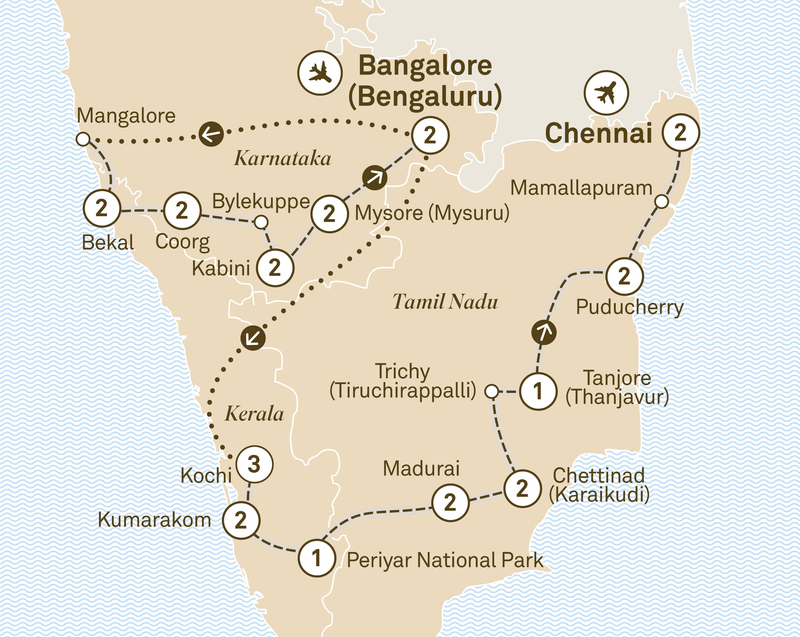 Enjoy an in-depth exploration of South India’s many wonders during this 26 day journey of discovery. Rich in colonial history and flush with spectacular scenery and wildlife, this itinerary is the ideal way to see the whole of this incredible region. Start in Bangalore, heavily influenced by its British colonial history. From there, the amazing wildlife of Nagharhole National Park and the lush highlands of Coorg beckon, before you embrace your spiritual side during a visit to Bylekuppe, the second largest Tibetan settlement outside of Tibet. Arriving in Mysore, join a local family for dinner and witness the city’s impressive illuminated palace. Explore the coastal city of Kochi before heading to the famous Kerala Backwaters, one of the world’s great waterways. Opportunities for wildlife spotting abound in Periyar National Park, while in Tamil Nadu you can enjoy several days exploring local temples, culture and traditional life. From French-influenced Puducherry, head to Chennai where your southern sojourn concludes. Visit the Botanical Gardens, Tipu Sultan’s Summer Palace and the Bull Temple, then drive past the Government Secretariat, Legislature Building and Cubbon. Enjoy lunch and wine tasting at Grover Zampa vineyards to learn about the art of making wine. Fly to Mangalore and continue to Bekal, located on the coast of the Arabian Sea. Relax by the sea during a two night stay. During your morning’s exploration visit Madhur Temple, Malik Deenar Mosque and Bekal Fort. The remainder of the afternoon is yours to enjoy the resort’s facilities at leisure. Leave for Coorg and a two night Special Stay, staying in a Lily Pool Villa with your own private pool. After lunch, enjoy a guided walking tour of a working coffee and spice plantation. In a Kodava village interact with the locals and appreciate their age-old culture and traditional houses. After learning about their culture, enjoy a delicious home cooked Kodava lunch with the villagers. Drive to Kabini, the base for exploring Nagharhole National Park and your two night Special Stay. En route visit Bylekuppe Monastery, the second largest Tibetan settlement outside Tibet. Gather around the infinity pool with its views of the Kabini River for refreshing drinks and canapés. Tonight watch a troupe of Kuruba tribal dancers or a documentary about the local wildlife. Rise early for a game drive around the park. Afterwards visit a nearby Kuruba tribe village with a naturalist, who will talk about local agriculture. Later this afternoon keep your eyes out while on a boat safari along the Kabini River. Leave for Mysore, known for its glittering royal heritage and colonial buildings before checking intoyour hotel for two nights. Later visit Mysore Palace, Chamundi Hills and St. Philomena’s Church. Return to Mysore Palace to view the magnificent weekly illumination by approximately 97,000 lightbulbs. Enjoy a morning walk through Devaraja Market or learn about the hand-painted Indian card game called Ganjifa. Drive to Srirangapatna Fortress, the former capital of the Tipu Sultan. Enjoy dinner with a local family in Mysore related to the former royal family. The host has converted most of the rooms of her home into a colourful local school for children. Visit Somnathpur, then continue to Bangalore for a flight to Kochi. Upon arrival check into your hotel, your beautiful colonial-era home for the next three nights. Head down to the harbour and watch the local fishermen expertly handling the Chinese fishing nets. Discover the different colonial influences during your tour of Fort Kochi, then visit Mattancherry Palace, Jew Town and the Synagogue. In the evening, witness a traditional Kathakali performance, a highly evolved classical form of dance, drama and music. Visit a local market and learn the secrets of South Indian cooking or enjoy a Me Time yoga workshop. Alternatively, visit Kumbalanghi Village to experience traditional village life and activities. Dine at Pepper, an all-day diner, or try Rice Boat, a seafood specialty restaurant. Otherwise try Dolphins Point multi-cuisine barbeque and grill. After a relaxing morning, travel into the Kerala Backwaters to Kumarakom and your hotel the next two nights. Luxury Houseboat - Alternatively, take the opportunity to spend your first night in Kumarakom on board a houseboat and cruise through the lakes and Backwaters past small villages to witness the local life. Included at no extra cost but must be pre-booked. Visit Philip Kutty’s Farm and enjoy a Keralan cooking class and lunch, or unwind with a traditional Ayurveda massage before lunch at the resort. Tonight enjoy your farewell dinner. Ascend into the highlands to Periyar National Park and Wildlife Sanctuary. Located in Thekkady, this wildlife reserve is known for its elephant population. In the afternoon, take a boat cruise on Periyar Lake. Enjoy an overnight stay. Join an early morning guided jungle walk in the reserve or take a jeep tour through the surrounding countryside, passing local spice farms and plantations, for panoramic views over Tamil Nadu. Wander through a small family-owned spice plantation and learn how spices grow before enjoying a lunch prepared by the family. Cross into Tamil Nadu, the ‘State of Temples’ and drive to Madurai, known as the ‘Athens of the East’. Tonight relax at your hotel. dating from the 1500s. Dedicated to the consort of Lord Shiva, its nine towering gopurams – or monumental gates – and 12 towers rise high above the surrounding countryside. This evening return by Tuk Tuk to this magnificent Hindu temple to witness the rituals and celebration of the evening puja ceremony. Drive to the small village of Karaikudi, located in the area known as ‘Chettinad’. The merchants and traders (the Chettiars) amassed fortunes from their roles as bankers, building remarkable homes. Experience a bullock cart ride through the narrow streets exploring the charm and faded elegance of colonial bungalows and merchant houses, stopping for a weaving demonstration en route. Stay at your beautifully restored Art Deco mansion for the next two nights. Witness ‘Kolam making’, colourful designs made with dyed rice, before visiting a pottery village to watch the colourful local tiles called Athangudi being crafted by hand. This afternoon, take a heritage walk and visit Chettinad Palace. Enjoy a traditional cooking demonstration of Chettinad’s unique cuisine before a private Bharattnatayam classical dance performance, one of the most popular classical Indian dances. Settle back and feast on a typical Chettinad wedding dinner menu. Journey through the ‘rice bowl’ of Tamil Nadu and on to Trichy, the former Madurai Nayak capital. Choose to climb the Rock Fort Temple or visit the island and temples of Srirangam. Continue to Tanjore and stay overnight. Discover the World Heritage-listed 11th century Brihadishvara Temple. See a demonstration by master craftsmen on the ancient art of lost-wax casting. Also known as ‘precision casting’ or ‘cire perdue’ in French, it is a method of bronze casting dating back 5,700 years. Later, drive to the pretty seaside town of Puducherry, the former capital of the French territories in India, then known as Pondicherry. Stay at your romantic hotel, a beautiful tribute to the town’s French legacy. Learn how the local Tamil population successfully assimilated French culture with their own during a heritage walking tour. Stroll past charming Tamil and colonial fusion architecture and visit the Aurobindo Ashram. En route to Chennai stop at Mamallapuram to explore the spectacular World Heritage-listed Shore Temples. In Chennai, check into your beautiful hotel for a two night Special Stay. Dine on international cuisine at Spectra or China XO, featuring the flavours of China. Alternatively try Jamavar, specialising in Indian cuisine. Walk through Georgetown and discover its markets and colonial laneways or explore the 8th century Hindu temples in Kanchipuram. Alternatively, visit a local Indian market and take part in a cooking lesson. Later, discover the history of the Basilica of San Thome, supposedly the final resting place of St Thomas. Tonight, reminisce about your wonderful journey at your farewell dinner. Transfer to Chennai airport and depart South India with wonderful memories.